If you ever walked into a mattress showroom, you would be forgiven for feeling overwhelmed. These days you can select from a wide range of mattress brands but among the most popular are Sealy Posturepedic and Serta Perfect Sleeper. But before you choose between Sealy vs Serta, you first need to make a decision on what type of mattress technology you want. Memory foam mattresses conform to your body and disperse your weight evenly. These mattresses tend to be ideal if you tend to toss and turn during the night or sleep lightly. They can also be a good option for anyone who has had a hip or knee surgery or simply a painful joint because the pressure on any single part of the body is alleviated. A drawback of memory foam mattresses is they tend to be warmer than traditional innerspring mattresses. But over time mattress technology enhancements have improved air circulation to counteract this temperature issue. Memory foam mattresses win high marks for their resistance to bacteria, mites, bed bugs, and even mold. Foam mattresses tend to cost less than Sealy Posturepedic and Serta Perfect Sleeper mattresses, which are innerspring mattresses. Foam mattresses come in many forms, such as gel foam, solid foam, and memory foam. From one side of the bed to the other, foam mattresses offers support that appeals to sleepers who tend to move a lot during the night from one side of the bed to the other. If you sleep with a partner who tosses and turns each night, a latex mattress may be the answer to your interrupted sleep. Latex mattresses are resistant to motion and are designed to ensure no single part of the body is unduly pressured. So, if one part of your body is more sensitive than another, a latex mattress may be a good fit. And because prices have come down significantly in recent decades, a latex mattress is much more affordable than it used to be. Both Sealy Posturepedic and Serta Perfect Sleeper mattresses are innerspring mattresses. Innerspring mattress designs are still among the most popular despite being one of the oldest types of mattress technologies. In innerspring mattresses, steel coil support systems are generally used to construct durable mattresses. Padding and upholstery surrounds pocketed coils and often the steel springs are layered for a more comfortable night’s sleep. 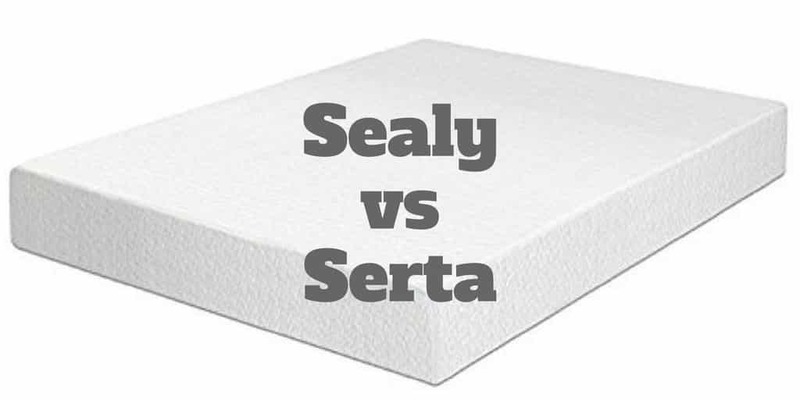 As a low cost, highly comfortable mattress, innerspring mattresses remain among the best-selling of all mattress types but if you had to pick between Sealy vs Serta, which should you choose? Sealy Posturepedic and Serta Perfect Sleeper mattresses are popular because they combine comfort and reasonable cost. Both of these innerspring mattresses come with a 10-year warranty, a comfort layer thickness starting at 2 inches (and up to 6 inches for the Serta Perfect Sleeper and 7 inches for the Sealy Posturepedic), and an adjustable foundation option. Where they differ is in firmness. 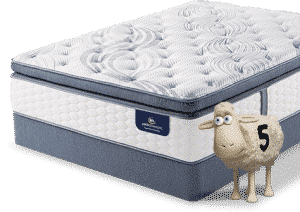 The Serta Perfect Sleeper ranges from soft to firm while the Sealy Posturepedic has a minimum overall thickness of 9 inches (compared to a 5.5 inch minimum for the Serta Perfect Sleeper), so it ranges from medium-soft to firm. However, the The Serta Perfect Sleeper has a more extensive range of comfort layer materials. While the Sealy Posturepedic only supports regular foam, Serta offers regular foam, memory foam, gel memory foam, and regular gel foam. If you want an affordable and durable mattress, the Serta Perfect Sleeper fits the bill. Like all mattresses, it will probably sag over the long term but it’s time-tested durability means you shouldn’t expect sagging anytime soon after purchase. It’s known to have good back support and caters to customers who like both soft and firm mattresses. If you are bothered by a partner keeping you awake at night with their tossing and turning then the Serta Perfect Sleeper is a good option. Unlike memory foam mattresses that can sometimes sleep warm, the Serta Perfect Sleeper regulates temperature well so you shouldn’t experience uncomfortable heat. A standard queen set can cost as much as $1,499 but you can find models that are significantly less costly. Serta Perfect Sleeper mattresses come in a variety of styles and prices, from the Castleview Plush queen bed set to the Laraine Luxury Firm. If you are willing to pay more, you will enjoy more innerspring coils and greater memory foam thickness. The pricing is similar to Serta but you will get a little bit more for your money from Sealy when it comes to coils and foam thickness. Like the Serta Perfect Sleeper brand, Sealy Posturepedic mattress brands are long-lasting and have 10-year warranties. Before comparing Sealy Vs Serta mattress brands, consider first what type of mattress will best suit your sleep needs. Both Serta Perfect Sleeper and Sealy Posturepedic are innerspring mattresses which are popular for being affordable and comfortable. You get a little bit more for your money with Sealy when it comes to coils and foam thickness though the pricing of both are similar. The Serta Perfect Sleeper has a more extensive range of comfort layer materials so if that is more important to you than coils and foam thickness, Serta may be more suitable. If you find that innerspring coil mattresses don’t match what you are looking for consider latex, foam, memory foam, or hybrid mattresses. Have you shopped for a Sealy or Serta mattress? Which did you choose and why? Let us know, we would love to hear from you. >> Can I Retire Yet? >> Do You Save More In States With No Income Tax? ‹ Zcash vs Ethereum: What Is The Best Cryptocurrency?